So, Tuesday morning. Is it late enough in the week for some booze news? Course it is. Up on Edinburgh’s Royal Mile, The Scotch Whisky Experience, has unveiled a new whisky bar. The bar offers over 360 different whiskies from across Scotland, including single malts, blends and increasingly fashionable single grain whiskies. Knowledgeable staff are on hand to help guide guests through the vast collection. The Scotch Whisky Experience has been open for 25 years and the last four of those have seen the attraction invest over £4 million. As well as the new bar, the money has been spent on redeveloping the attraction’s shop and installing the Diageo Claive Vidiz whisky collection – at over 3000 bottles, it’s believed to be the largest in the world. The whisky industry has long been trying to shake off any lingering associations that the drink is the sole preserve of crusty old buffers. 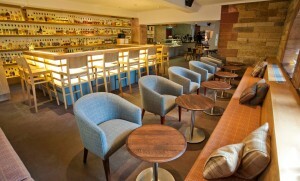 Light and modern looking, the new bar does its bit modernise the drink’s image. Reclaimed oak staves, beautifully crafted oak surfaces and high tech lighting help to bring out the colour of the whiskies and give the bar a fresh feel. The bar is also situated alongside Amber Restaurant, where tailored tastings and food matching options are available. Head Chef David Neave drives the kitchen at Amber and he has consistently earned sparkling reviews for the venue. We also hear lots of good reports about the cooking at Michael Neave Kitchen and Whisky Bar. Located just down from The Scotch Whisky Experience, the newish restaurant is run by David Neave’s son.